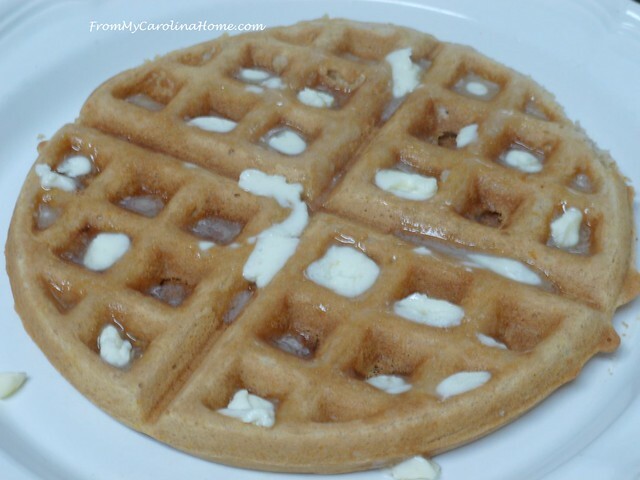 It’s National Waffle Day, and I had an idea for a great new waffle, full of flavor yet very simple to make. Many moons ago, when I was in college, I worked at a mom-and-pop breakfast diner whose specialty was pancakes and waffles. Their waffles were light and fluffy with a crispy crust that soaked up butter and still had that crunch. They were not Belgian waffles, but flatter than the Belgian waffles in other establishments, and big as a dinner plate. For years I have searched the diners for one like it, without success. Neither IHOP nor Waffle House could even come close, and many tries with smaller diners struck out as well. 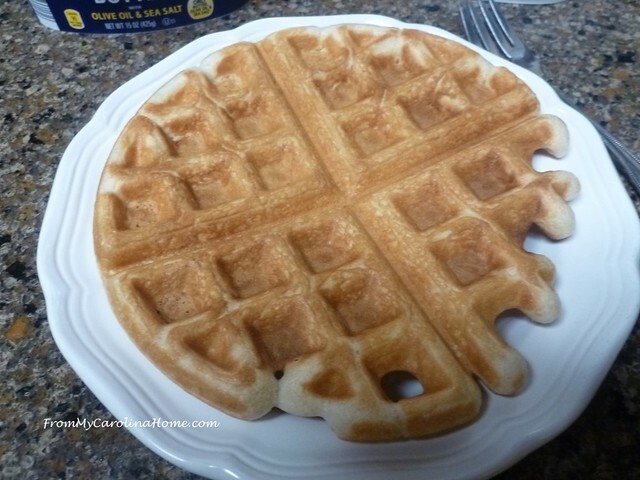 I have tried all kinds of recipes for waffles at home, some from family members, others from friends, with eggs, without eggs, trying various mixes, making from scratch, thin and thick batters of all kinds. I had an old style waffle maker given to us for a wedding gift, and it was terrible as the waffles always stuck to it no matter what I did to keep that from happening. I threw it out years ago, and tried with my mother’s waffle maker, but struck out there, too. Finally, I figured out a close substitute with a new waffle maker and a simple mix. In my humble opinion, there is just none better or closer to the goal from my early working days than the very simple use of one particular mix, Aunt Jemima Complete Pancake Mix used with a modern waffle baker. Be sure you get the Complete Mix, as they make more than one. I bought the wrong one by mistake once, and it didn’t give me the same results. The upside is that the recipes with it are really easy, little measuring to do and they always come out light and fluffy with that wonderful crisp crust. So, today, we add more flavor to the humble breakfast waffle. Start with combining the pancake mix and cinnamon in a bowl. 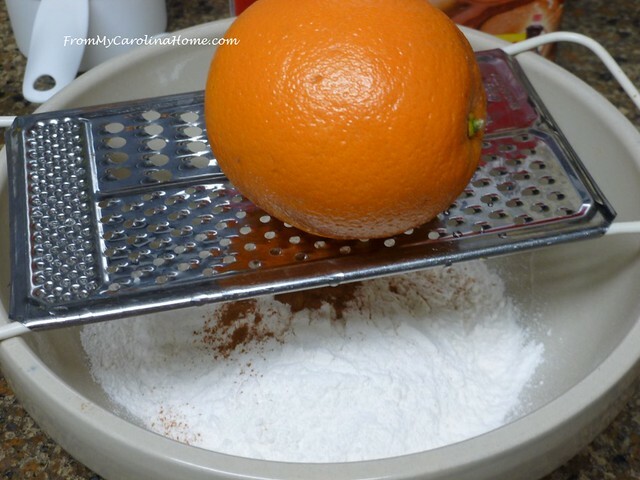 Grate orange zest directly into mix. Add water and oil, and stir until most lumps are gone. Let the batter sit while griddle heats, 2-3 minutes, it will thicken up. Preheat waffle griddle to medium heat. 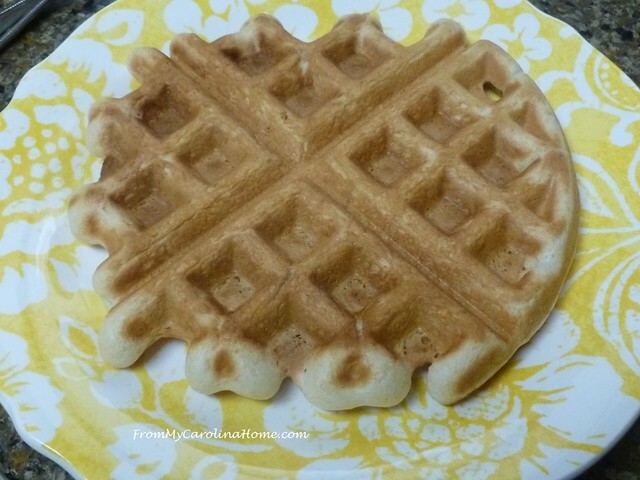 Pour one cup of mixture in waffle iron, close cover, then bake for 10 minutes. 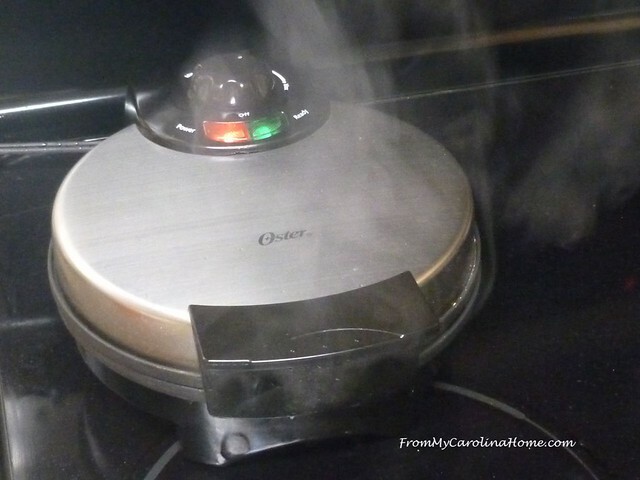 There will be a lot of steam at first, and then will decrease as the waffle cooks. The first one isn’t quite a full waffle, LOL!! Oh well, it still tasted good. Serve with orange butter if desired. Just mix some of the orange juice from the orange into softened butter for extra burst of orange flavor. If you want something sweeter, you could make a glaze with the juice and some powdered sugar. I mixed the softened butter and orange juice up without extra sugar. It added a nice orange flavor to the waffle breakfast. You can just drink the juice with breakfast if you prefer. This might look like a lot of orange butter, but I don’t put syrup on my waffles. If you like syrup, just a bit of maple would taste nice. Combine pancake mix and cinnamon in a bowl. Grate orange zest directly into mix. Add water and oil, and stir until most lumps are gone. Let sit while griddle heats, 2-3 minutes. 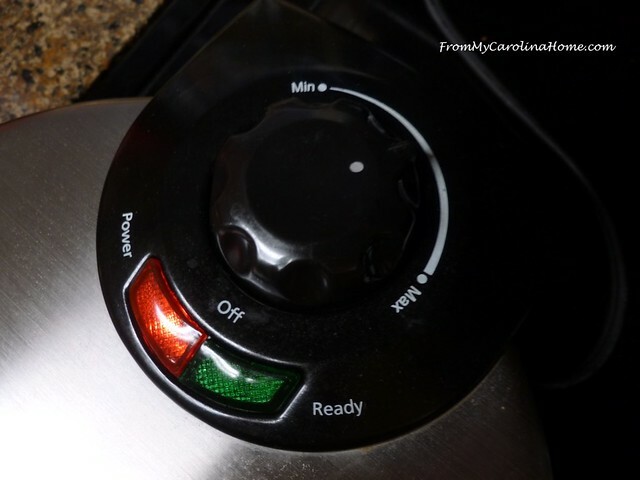 Preheat waffle griddle to medium heat. 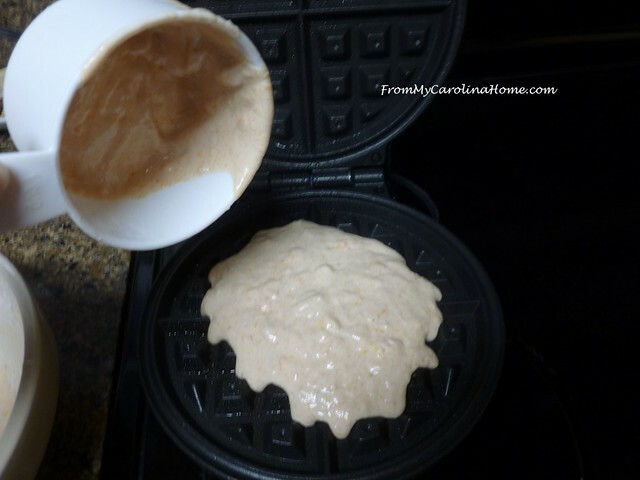 Pour one cup of mixture in waffle iron, close cover, then bake for 10 minutes. Remove and bake second waffle with remaining mixture. Yield 2 small 8-inch waffles. Serve with orange butter if desired, or plain butter and syrup. Double the recipe for more waffles. Yum! Do you like to make waffles at home? 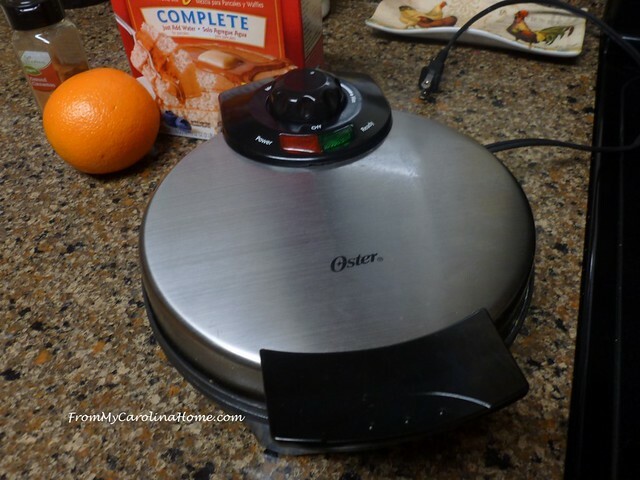 My waffle maker is the Oster Belgian Waffle Maker available on Amazon. I have a little 2 square iron that I bought in the sale aisle years ago at WalMart($9.99). Works like a charm. I use the recipe that came in the instruction book but substitute whole wheat pastry flour for the white flour and add in 3 tablespoons of powdered buttermilk and a teaspoon of cinnamon. The whole wheat pastry flour kicked it up to “health food” 🙂 That’s what I tell myself. I like the idea of the oranges. Will give it a try. MMMM….waffles! We love them. Sometimes have Breakfast for Dinner to be able to fully appreciate them. Like you, we like the AJ Complete Mix. 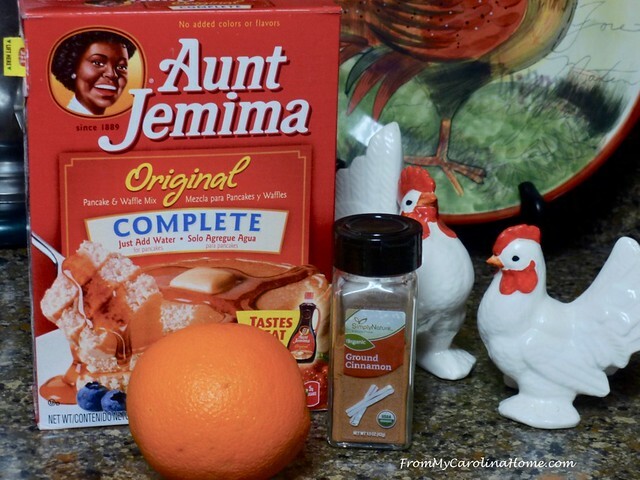 Your idea of adding orange and cinnamon sounds great! Will give it a try next time! My mouth is watering because of your wonderful photos. The picture with the steam rising from the waffle maker pushed me over the edge! What a wonderful idea…orange and lemon are my favorite flavors with orange favored for breakfast. Thank you once again for a fabulous post. My Mom gave me a new waffle maker for Christmas and I’ve used it a few times. Fresh, homemade waffles are the best! I’ll give your recipe a try Carole – it looks delish! Great idea, Carole, to add cinnamon and orange zest. And I’m with you–the first one never turns out quite full! Our waffle iron came from a garage sale–it just keeps going. For my waffle recipe, I use Beatrice Ojakangas’ The Best of Pancake & Waffle Recipes flip book. I met Beatrice in Duluth. She has an amazing kitchen and cookbook library. For dinner! I’ve always used bisquik with eggs… Mom used to use AJ pancake and waffle mixes, I’ll have to do that! Thanks for the idea, I had a waffle in Perkins the other day, it was very dry and disappointing…. I used to eat the first one Mom made to ‘prime’ the wafflemaker, it was always a bit rubbery for some reason! but soft and moist and I’d eat it w/o butter or anything. I have a new waffle machine, and I tried the recipe that came with it. What a dud! I’ve gone back to my tried -and-true recipe from a cookbook published in the 60s. Hello Carole, I loved reading your post this morning. One of the reasons being that my Dad loved Breakfast and homemade waffles were one of his favorites! Kevin and I do not own a waffle iron, but we both enjoy having pancakes every once in awhile and I will add your ingredients to the batter we use. We use a recipe from a Betty Crocker cook book and we have tried adding other ingredients and always been pleased. I also enjoyed reading everyone’s comments and how much your recipe sharing is a delightful read for everyone and how much they enjoy trying your choices that you share! I am off today to hopefully finish a baby quilt that is actually turning out to be a very pretty quilt. 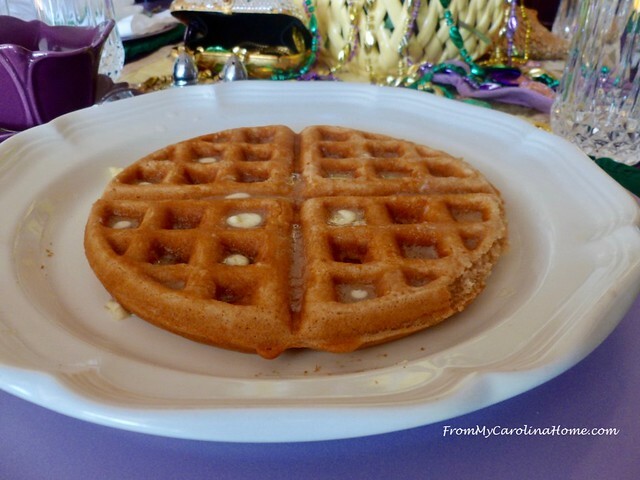 Thank you again, Carole, for sharing your recipe for delightful Waffles with us! Hubby and I just may have pancakes tonight for dinner! Have a splendid day! I have a heart shaped waffle machine, my family bought me for Christmas. You can choose whether you want a crisp exterior and soft interior or even crispness. It even tells you when the waffle is done!😆 My favorite is pumpkin waffles, they stick with me better than plain ones. Love waffles and cinnamon! Yesterday, I made sourdough waffles with vanilla and nutmeg. Sometimes I use buttermilk. I’ve used pumpkin, and I’ve used eggnog. 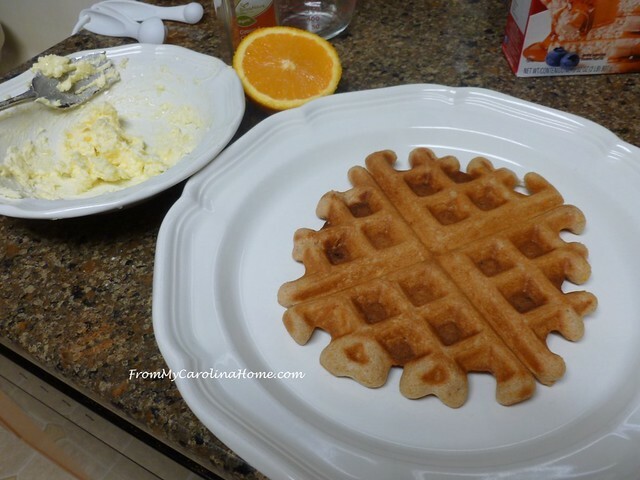 Waffles are versatile and it is fun to try different flavors. I am going to add orange next time that I make them! Yumm! Waffles are not as popular here as in the US. But I still enjoy them when I can. I do make waffles at home, and will try this next time. I think my B & D waffle iron will probably do a great job. I haven’t used a mix lately, so I will have to get that one. I love orange flavor, so this sounds delicious to me!